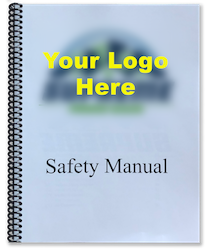 Customize your own Company Safety Manual. The document will come both PDF and two hard copies. It is easy to email to customers who inquire and it is specific to the work you do as window cleaner and pressure washer. All safety policies are based on OSHA 1910 General Industry Standard In addition, to the Safety Manual you will receive a SDS Book and and Equipment Inspection Log book for your company.